"This idea was formed about a year ago," says Bryan Bradigan, owner operator at Colorado Craft and former general manager at Altitude Hospitality Group. "Conversations over beer." While drinking at a local spot Bradigan, his wife and owner, Mandy Bradigan, and Mario Vasquez, owner and executive chef, were able to determine that highlighting local breweries, distilleries and farms was the foundation for their next restaurant venture. Mario Vasquez, owner and executive chef. "We like to drink beer, have good cocktails and great food and I think that's something we want to bring to the table in this community," says Vasquez. "We're trying to create something very approachable but really push to make every person's plate very special and everybody's experience very special." Dave Lux, partner at Concept Restaurants, and owner of Colorado Craft, has been engrossed in the restaurant business since 1974 after moving to Colorado Springs from Boulder and establishing Jose Muldoon's downtown. He went forward to build Mackenzie's Chop House, Flatiron's American Bar & Grill and the Ritz Grill which closed in August 2017, where Colorado Craft now stands. "It's time to bury the Ritz and move on," says Lux frankly. "I really enjoy the fact that Colorado Springs' dining and entertainment has changed so much and it's great to see it become so food oriented." Lux insists that this is his "last escapade" after 50 years in the restaurant world and is ready to pass the baton to the next generation. He credits the quick transition of the building to a solid "team effort from a bunch of young people." That same resourcefulness and cohesive group mentality translates into Vasquez's approach to the cuisine as they debut thoughtful and concise menus with eight main courses for lunch and dinner. "We wanted to have room to play with daily features," says Vasquez. "Some type of innovative or fun spin on a classic dish." Colorado Craft sources proteins from Corner Post Meats and other local ranchers with seafood direct from the fisher(wo)men through Wild Woman Fish Company. To promote the social atmosphere Vasquez says they'll bring in grass-finished beef and special select cuts. "Big cowboy steaks and whole Dutch ovens of beef stew to utilize the big tables and have family style," beams Vasquez as he reaches his arms out wide as if to give us a hug. "It's a way for us to bring people together and really get back to the family feeling of a dining experience." We try the short rib dish from Sangres Best with velvety celery root puree and light, crispy celery root chips on top of roasted root vegetables and caramelized apples. A peach beer from Rocky Mountain Brewery transforms into a glaze that emits complimentary notes of stone fruit. The same purveyor is responsible for the simple yet ingredient-centric cheeseburger with a chuck, short rib and brisket steak burger patty available for just a buck more. Produce selections will follow seasonal growth patterns, which tend to be later than expected anymore, so once fruits and vegetables reach their peak freshness Colorado Craft will practice methods of preserving, fermenting and pickling in the confit style. The giardiniera exemplifies that sentiment with pickled vegetables that present in a mason jar with a malleable pretzel roll from Delicias Bakery accompanied by whipped, turmeric and cayenne pepper butter. The briney small plate makes for a perfect pairing with virtually any beer. Credit Courtesy Rocky Mountain Food Report / Image courtesy of Lauren McKenzie, REN Creativ. Sous chef, Daniele Klungseth, contributes a distinct green chili recipe that Vasquez says is "a play on ramen." 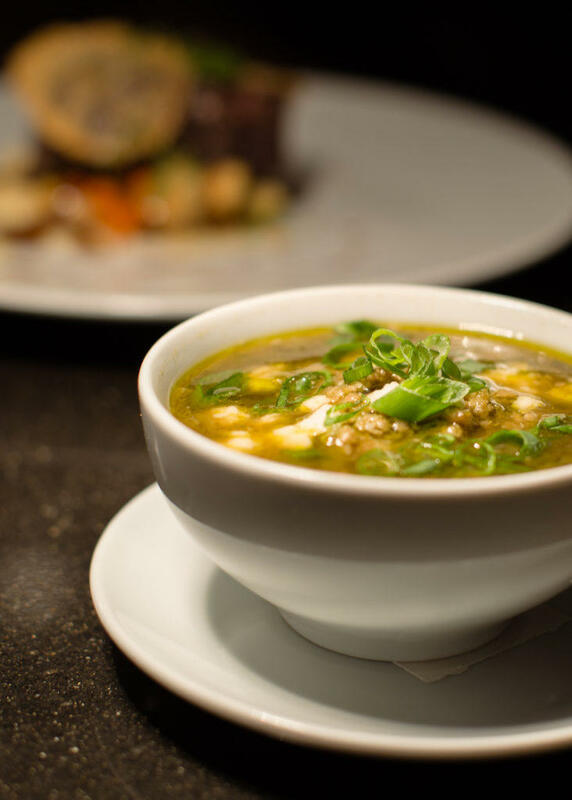 The base seems familiar, a savory blend of hatch and Pueblo green chiles but then a flavorful, ground pork ball drops down in the center and disperses garlic, oil and a cohesive saltiness that meshes the entire soup together beautifully. Like most reputable restaurants the menu will update quarterly with the seasons and with that comes opportunities to push the envelope and experiment. We fell in love with the rich, wintry rotisserie chicken dish coupled with smooth, white cheddar grits, Pueblo green chiles for a touch of spice and balanced acid from the red kale and beet greens cooked down with stock and apple cider vinegar. The layer of crispy skin and juicy tenderness exhibits spot-on execution and finishes with a charred scallion salsa verde on top to lighten it up just a tad. 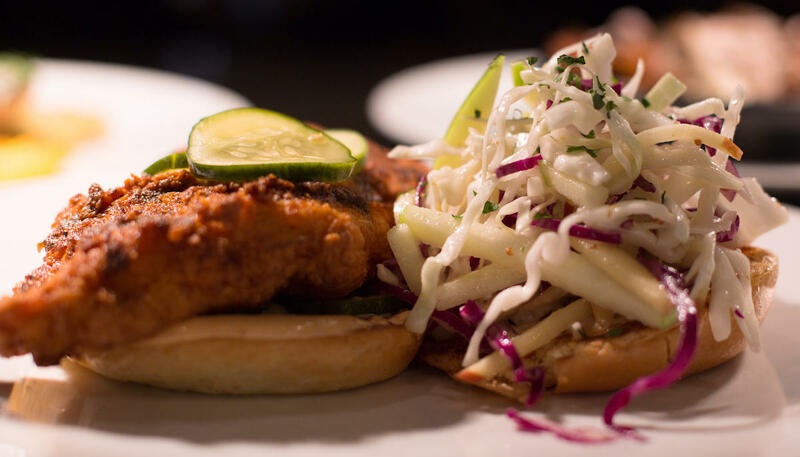 We have a hard time deciding which chicken entree we want to order more the next time we dine at Colorado Craft with the Nashville hot chicken sandwich on the table as well. Vasquez learned the secret process from a chef in Napa, California, who scoured the South on a mission to find the very best recipe. "It's one of the best crunches that you'll find in a fried chicken," says Vasquez, and we can vouch for it. Using dried local chiles to make their own chili oil, crispy, homemade bread and butter pickles and a heaping mound of apple cabbage slaw finishes with a pop from the cider dressing. You can stand in line for this sandwich. "It's not my full repoirtoire but it's a start," says Vasquez. "We want to take baby steps and grow the team and as guests trust us more we'll bring in more innovative cuisine." Accessible appetizers with intentional beer pairings make Colorado Craft a go-to spot for a pint of your favorite craft brew with a new backdrop to manage late night munchies or small plate cravings. Thick cut beer fries come from Colorado potatoes stacked like Jenga logs to pair with Red Leg Brewing Company's Blue Nose Brown. The malty beer goes further as it serves as a reduction in the beer mustardaise, folded in with caramelized onions, pickled, whole grain and spicy mustards and mayonnaise. "It's like a really crazy aioli with beer in it," says Vasquez. "And one of my favorite snacks." Us too. For more sharable starters that can prep your palate we dig the burrata cheese with soft mozzarella, aged balsamic vinegar, olive oil, slices of baguette and confit-toasted garlic. The idea is to take your toast, spread on some soft garlic, take a swipe of burrata with the olive oil and balsamic and crush up the bacon chip inside the cheese for a touch of salty ham which Vasquez calls "bacon love." We see Vasquez's originality and technique in the toasted farro and baby beet salad tossed in a citrus-cumin dressing, shallots, oil and lemon juice with a sprinkling of hearts on fire (miniature beet greens) for a touch of vegetal spice. "These are Mexican flavors incorporated into a more traditional French meal," says Vasquez. "I just really wanted to let the beets shine and the farro for texture so you also feel like you're eating something a little heartier with a lot of toasted cumin so you have that essence all over the plate." Desserts are the combination of great minds in the kitchen and showcase the balance Vasquez hopes to portray in the menu. We try a gorgeous mille-feuille, which many of us have seen in the form of a Napoleon, but this is light and airy, with puffed pastry and salted caramel decorated with a delicate twill. A heartier apple galette appears in a miniature cast iron pan made with palm sugar and tamarind to encourage more acidity from the fruit and finished with a slight scoop of Josh and John's vanilla bean ice cream. A dozen plated brunch options are available on Saturday's and Sunday's that are as far away from basic as Vasquez could manage so don't look for two eggs and hash browns on the side. "We want to really separate ourselves from that game," says Vasquez. "What we're trying to do is compose dishes that are fun and inviting and I want to focus on the brunch cocktails." House made Bloody Mary mix pairs with chilaquiles, or opt for sweet and savory with an apple waffle with bacon lardons and bacon whipped cream. 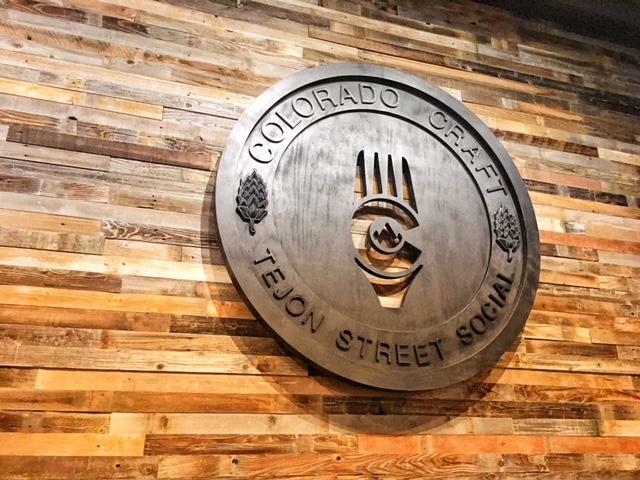 The mission at Colorado Craft Tejon Street Social is abundantly clear after our visit. The name glows in the light fixtures, it graces the walls and fully delivers in the menu we enjoy. The incorporation of quality food and beverage selections with a collaboration amongst a bevy of passionate Coloradans turns into a chance to set the bar higher for the entirety of Colorado Springs' culinary scene. 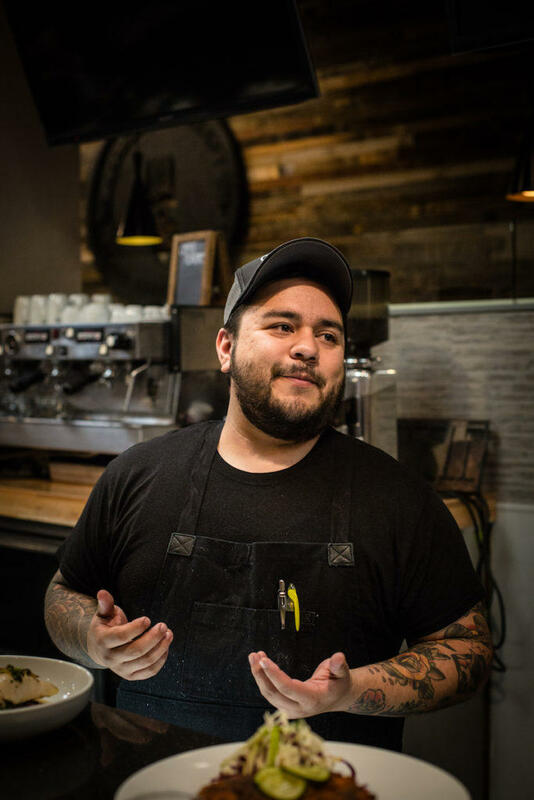 "I know a lot about freshness and about respecting the ingredients and that's what I plan to do here to grow great chefs," says Vasquez. "I don't want to be a star, I just want to make good food. I want my [chefs] to branch off into the city and make every other restaurant great to make sure we're serving the community the right way."